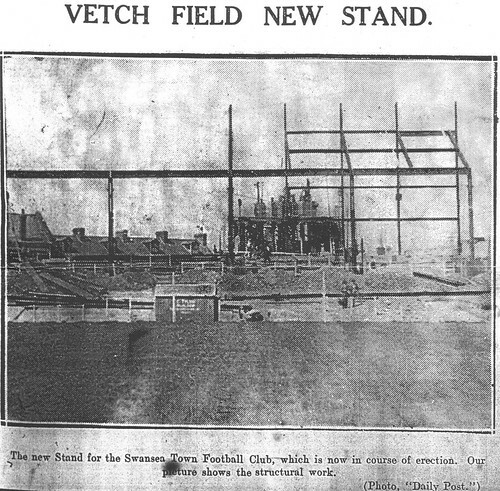 Football was played on the Vetch by local amateur teams from the late nineteenth century. Athletics and cycling also took place at the ground at this time. The land was owned by the Gas Works and its football team played there before the new Swansea Town club leased the site. When the Swans took over, the ground was at first open with banking later laid with railway sleepers. The ground was chosen because it was a central location in the town and had space for expansion. In the first season, the pitch was mostly cinders and so bad that players wore knee pads. The South (centre) Stand was built in 1913. It consisted of wooden benches and also housed the dressing rooms and offices. 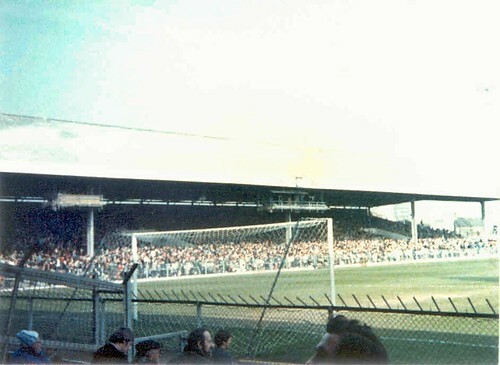 In later years, the top (west) end of the stand became the family area. The clock also became infamous for often being wrong. During the mid-1920s some noises were made about eventually increasing ground capacity to almost 60,000 but, despite confident pronouncements about the future, there does not appear to have been any realistic or affordable scheme properly to upgrade the ground. As result, the Vetch Field was only improved in stages, one side at a time, as resources became available. The double Decker West Stand was built in 1927 and towered above the rest of the ground. It marked a degree of confidence at the club that growth and the first division was possible. 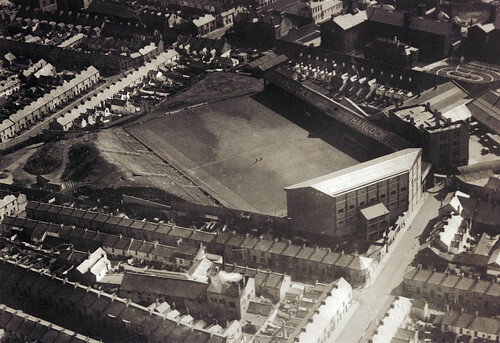 The average league attendance at the Vetch in 1926-27 was 14,286. And, as time went on, the shape and size of the physical environment became more and more of a constraining factor. The pitch itself simply could not be positioned parallel to the surrounding streets, and this meant that two of the banks could not be extended properly along the full side of the playing surface. As a result, in two of the corners neighbouring back gardens came to within a few feet of the pitch, and both the East Bank and the main Bank had to be tapered sharply at one end. 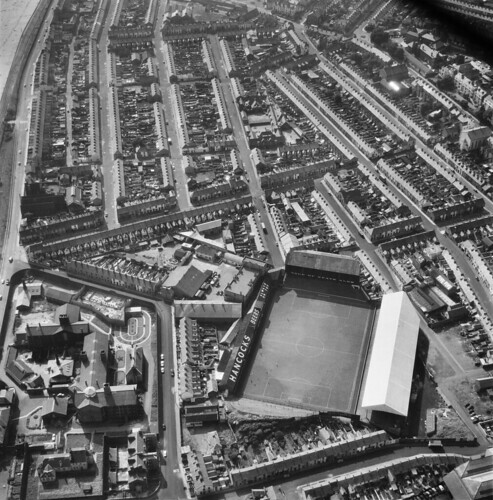 This gave the Vetch Field its unusual lop-sided appearance, and no matter what improvements were made the ground was always to look as though a square peg had been forced into a triangular hole. 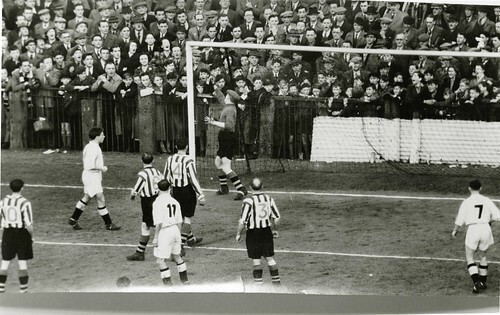 The North Bank remained the main terrace but standing on it often meant being pushed around and struggling to see. It was upgraded in 1951 with its top being leveled out, new entrances installed and its front lowered to beneath pitch level. 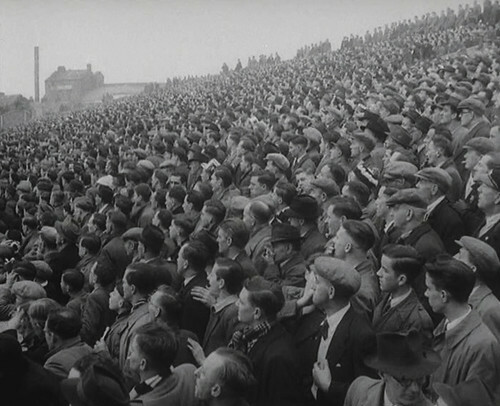 The North Bank had its roof installed in 1960, the same year floodlights were installed. They were first used in a friendly against Hibernian pictured below. 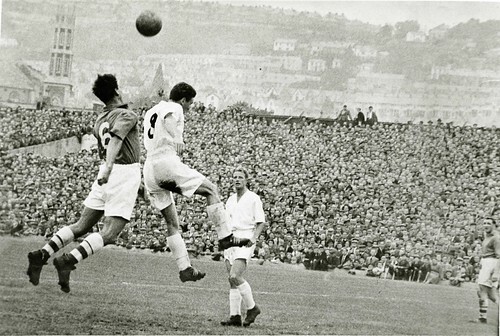 In 1968 a record attendance for the crowd was set when 32,796 watched Swansea play Arsenal in the FA cup. The crowd was so large that many were unable to see much and the squeeze was deeply uncomfortable. 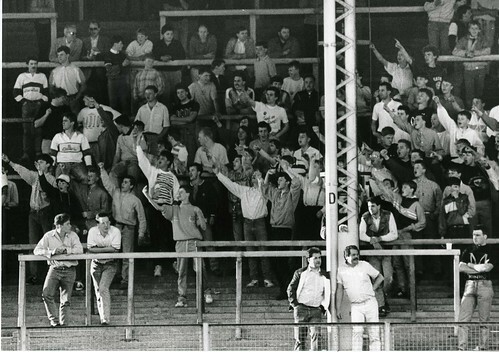 This game also saw some of the first serious hooligan trouble at the Vetch. The 1970s saw crowds collapse and serious financial problems for the club. In 1974 the club was saved when the council bought the ground for £50,000 plus a grant of £150,000. The east terrace was always oddly shaped because of the gardens in the street behind. Indeed, in the 1920s some residents had actually charged people to watch big games from their gardens. 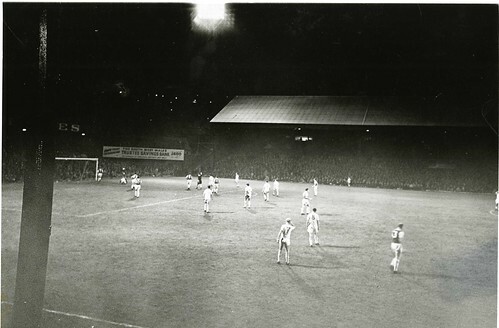 Then the club hung sheets across the space to block the view and, as is clear in the above picture, by the 1970s a score board obscured the view. It was also very close to the pitch as is clear below. 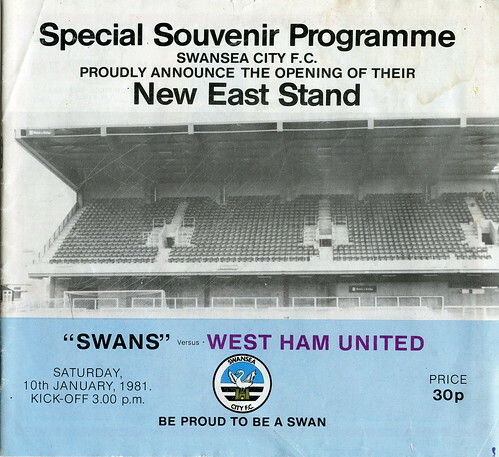 At a cost of almost £800,000, the East Stand was built in 1981 and originally intended to run the length of the pitch, replacing the centre stand. It did replace the open east terrace behind the goal and had 1,841 seats above a covered terrace. Like the terrace before it, the stand never covered the whole of the rear section of the pitch because of the encroachment of neighbouring houses. Those houses enjoyed a good view through the gap, especially after the removal of the score board. 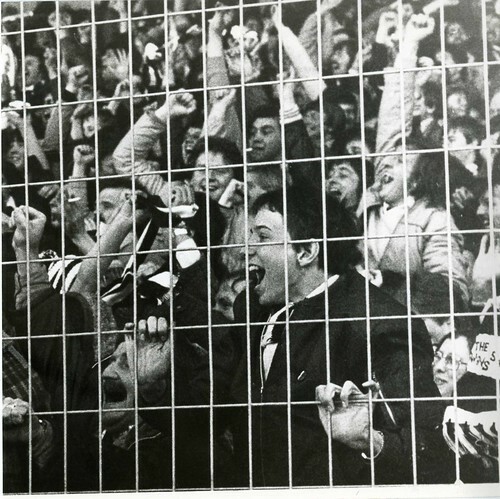 Fences went up in front of the North Bank in the 1970s to control the crowd. They eventually came down in stages in the 1990s as crowd behaviour improved and crowds dwindled. The early 1980s saw major investments in the ground, with new terracing and barriers installed and access improved. This was achieved with money from the Football Grounds Improvement Trust. 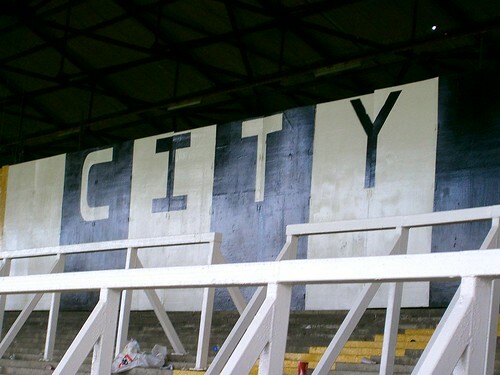 The wooden west stand was deemed unsafe after the Bradford City fire in 1985. The upper tier was closed immediately along with a section of the main stand. This brought the capacity down to 23,830, of which 2900 were seats. 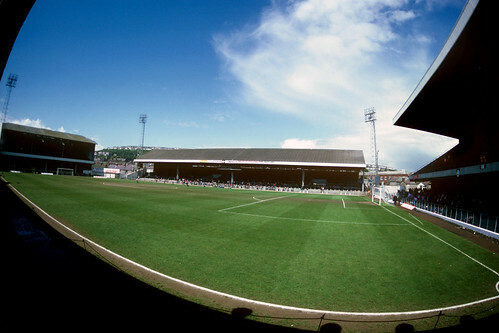 In the late 1980s the whole west stand was demolished. 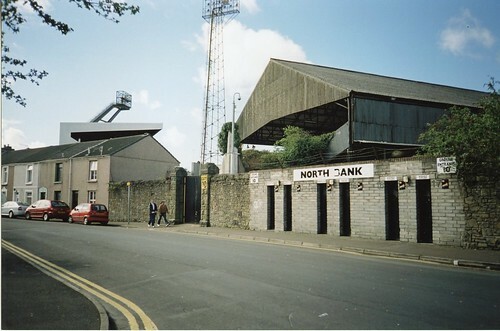 It was replaced by a new West Terrace that held away fans, although in the last seasons at the Vetch it was split up to create extra capacity for home fans as gates grew again. 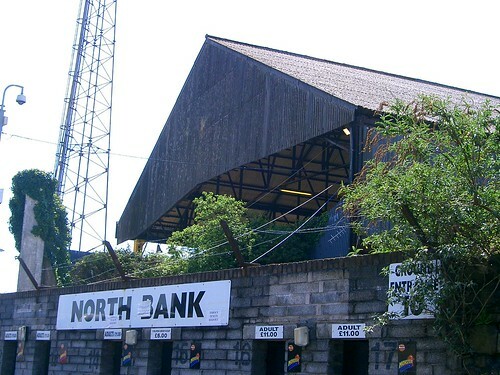 In 1990 the rear of the North Bank were shut down due to safety concerns. But the ground remained dear to supporters and was capable of generating a loud and vociferous atmosphere. Capacity fluctuated in the final years due to ongoing safety issues and maintenance work but it settled at around 11,700. The last game was in 2005 and an emotional affair. 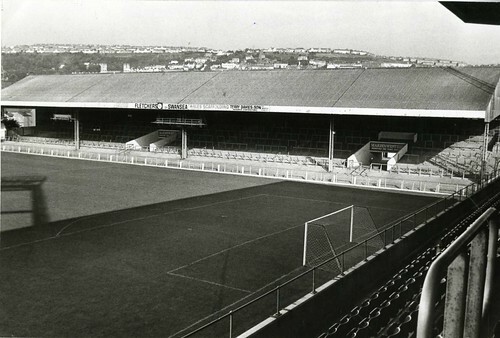 As high as we climb, and as distant the memory of the Vetch will become to some, nothing will ever come close to night games at the old stadium. You could hear the stadium roaring 45 minutes before kick-off, more often that not, and that was just with a few thousand people there by the time the match started! 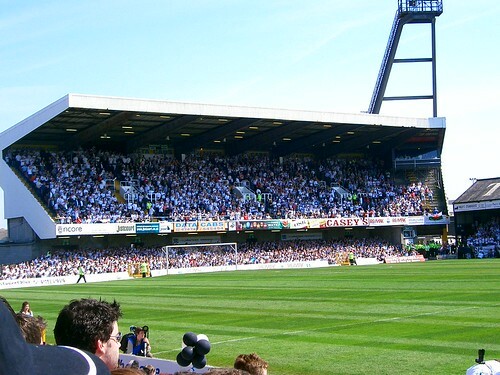 I always wished there was some way of filming the Sandfields in the build up to a game at the Vetch, as one of the best memories for me was walking through, and at every juncture (or so it seemed to a wide-eyed young fan) more people seemed to pour out of turnings, pubs, houses and more to join the human throng converging on the stadium. I was lucky enough to do work experience there whilst in school, so got to have a look around the top (or what remains of it) of the old West Stand, and heading up the stairways to where there used to be a second tier was quite sad, giving a feeling of “what once was” . Thankfully the Swans have managed an ascent during my lifetime equally as impressive as the one which preceded my birth by a handful of years. I love the Swans, and I like the Liberty Stadium, but for me the Vetch will always be the home of Swansea City FC. Absolutely spot on Scott! I guess there will be hundreds if not thousands of fans who will agree with every word you have written. Nothing for me beats the excitement I used to have as a nipper sitting on the little wall that ran along the edege of the pitch in front of the North Bank. Thanks for taking the time to write such a great post. The Vetch how i loved the Vetch & still do. The excitement of the first game of the season i loved the shear anticipation of it were will we finish in the league watching our new stars, the summer signings playing for the first time. Chatting in the pubs with mates that you have not spoken to since the end of the last season talking all things Swans. That slightly nervous feeling of walking up the small concrete slope on to the North bank seeing the Vetch in all her glory in the sunshine in August is something that will live with me for the rest of my life. She Looked always sort of immaculate at the beginning of the season fresh paint & the grass was so green and lush. Even the players running out of the tunnel on that first Satuday of the season had a extra bright white Swans kit on ! Sadly no more but thanks for the many great memories it was like losing a great freind when the Swans moved to the Liberty. I’m working with a local school looking at the last 50 years of Sandfields/St Helen’s Road. 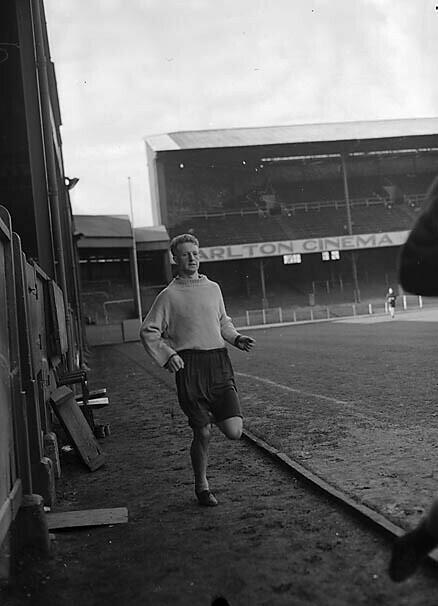 If anyone has any photos/memorabilia they’d be happy to share, please get in touch.